Could Trump actually pull federal workers out of Puerto Rico? 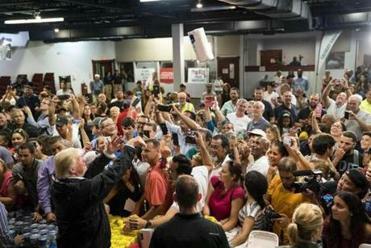 President Trump took part in a food and supply distribution event in Puerto Rico earlier this month. Could President Trump actually put an abrupt halt to federal relief efforts in hurricane-ravaged Puerto Rico if he wanted to? Hard to say. Experts offered differing views on whether a president has unilateral authority to cut off aid to a declared disaster area within the United States. Part of the reason for the lack of consensus: astonishment. 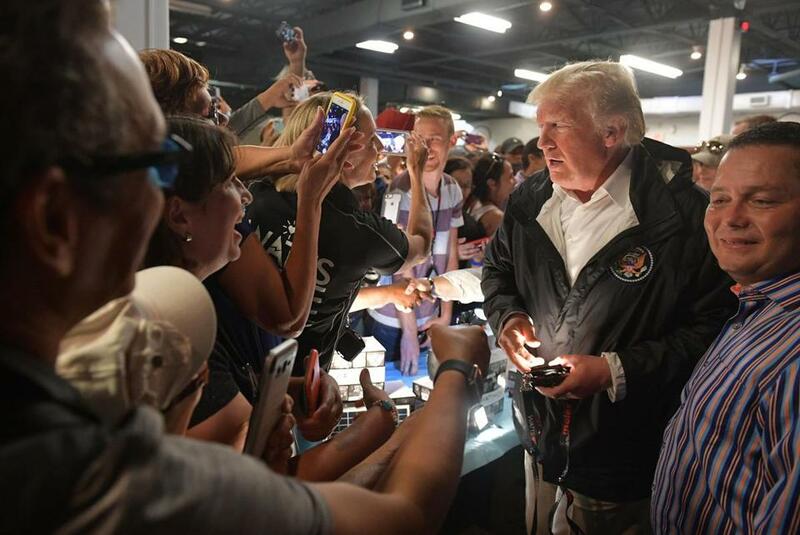 Experts said they cannot recall a president even threatening to halt disaster relief, as some believe Trump did this week in a series of tweets he sent about Puerto Rico. “ ‘Puerto Rico survived the Hurricanes, now a financial crisis looms largely of their own making.’ says Sharyl Attkisson,” Trump tweeted Thursday morning. Richard T. Sylves, an expert in the workings of the Federal Emergency Management Agency, said if Trump was indeed threatening to withdraw aid, that would be unprecedented. “To my knowledge, no president has ever threatened to shift federal disaster workers and resources away from a state or state-equivalent jurisdiction when post-disaster needs were still acute,” said Sylves, professor emeritus in the Department of Political Science and International Relations at the University of Delaware. Another expert, James Fraser, agreed. But the two experts differed on whether the president holds the power to call off relief efforts. The ultimate say on whether or not to issue a federal disaster declaration in the first place, like the one issued for Puerto Rico, is up to the president. A presidential disaster declaration triggers a host of federal relief efforts, and experts said there is no preset maximum dollar amount that can be spent to respond to a particular disaster. If FEMA were to need a mid-year budget increase to help fund its disaster relief efforts, that would require approval from Congress and the president’s signature, experts said. Sylves said he did not believe a president has unilateral power to stop aid efforts once a disaster declaration has been made. “It may be possible for a FEMA presidential appointee to shift some personnel resources, were he or she to receive orders to do that from the president. However, as these officials take an oath to obey the law before they assume their duties, they would have to square this behavior with FEMA’s mandated laws and policies as well as with their own conscience,” he added. Fraser, on the other hand, said he believed the president’s powers are broad enough for him to halt aid if he wants. A spokesperson for FEMA did not say whether the president has the authority to stop aid efforts after making a disaster declaration. But the spokesperson said the length of the recovery process after a disaster varies for each event and noted that FEMA personnel continue to work in Louisiana to support post-Katrina recovery efforts and the agency continues to support New York and New Jersey officials with post-Sandy recovery. The spokesperson said the goal is for any recovery process is to move as swiftly as possible to help restore normal routine.